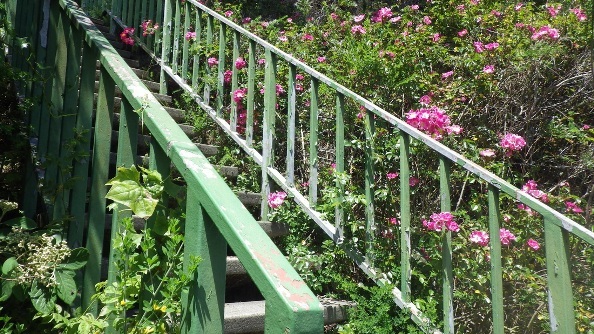 One of the charms of our neighborhood are its stairways – or “lanes.” We’ve written about them before, HERE. 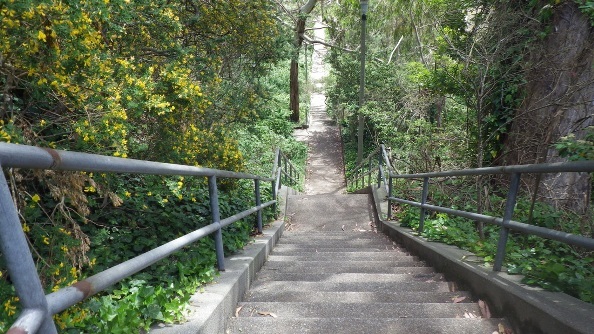 Recently, hiker Tony Holiday who blogs at Stairways are Heaven posted about a walk that started with Forest Knolls. 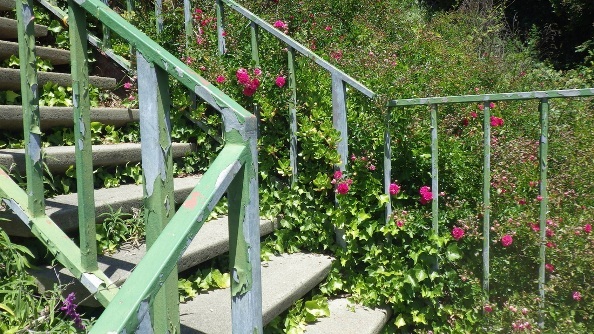 His photo essay is partially republished here with permission and minor edits. 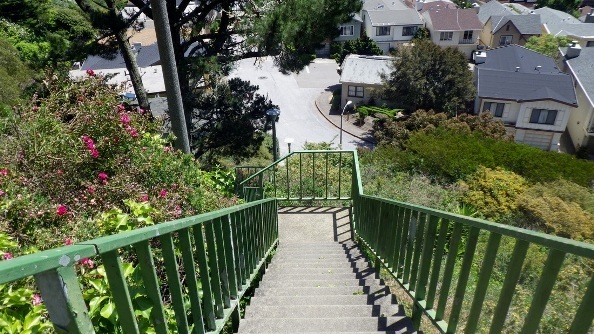 San Francisco’s Mount Sutro has several stairways with over 100 steps. 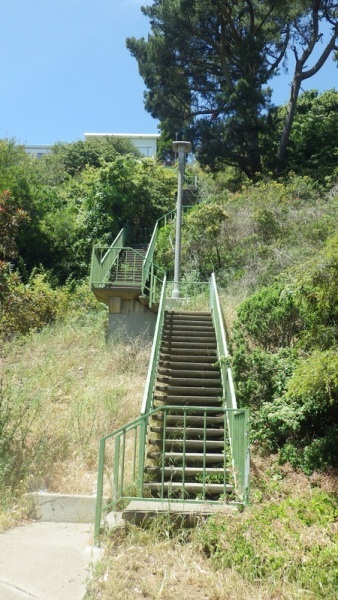 The Medical Center Way stairs that ascend from behind the hospital buildings on Parnassus total about 136. Farnsworth Lane: 149. 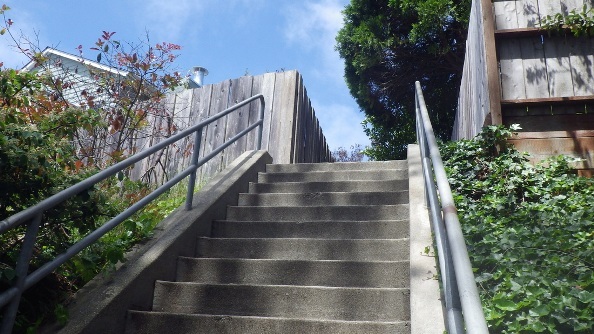 Around on the south, east, and west sides, the Forest Knolls neighborhood has Ashwood (109 steps), Blairwood (337), Glenhaven (167), and the longest, Oakhurst Lane (353-ish). 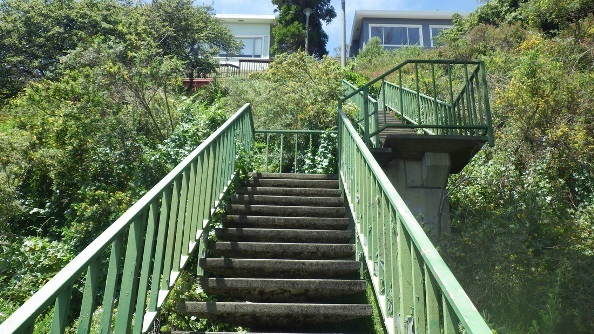 It’s 17 steps down from Clarendon and a walkway to start. 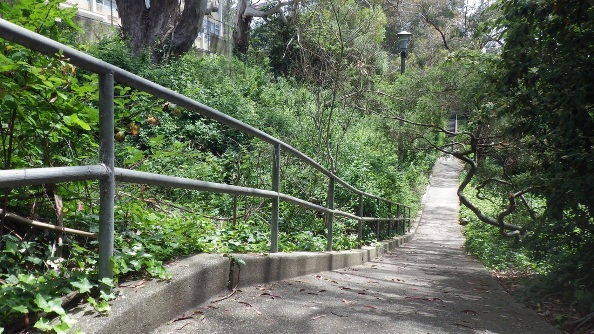 … and leads up to Warren in Forest Knolls. That’s the school to the left. 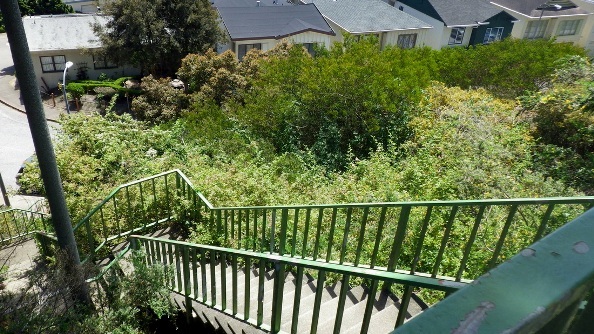 …Looking down from near the top of Ashwood. 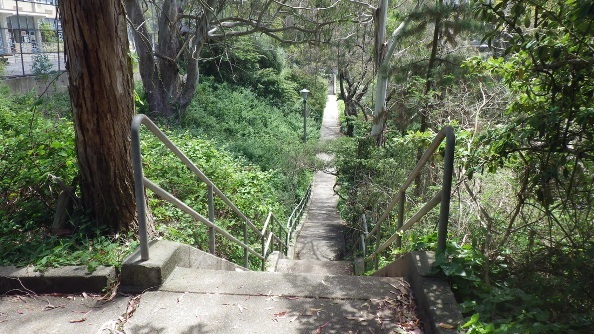 At the top of Ashwood Lane, Glenhaven Lane, my next to-do stairway, necessitated a short walk to the east. 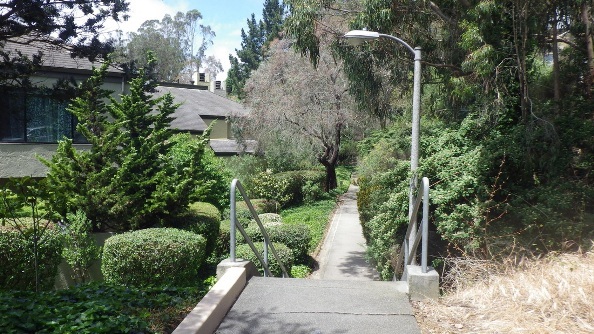 Here’s Glenhaven in distance at the end of Oak Park Dr.
It’s a garden by the steps. 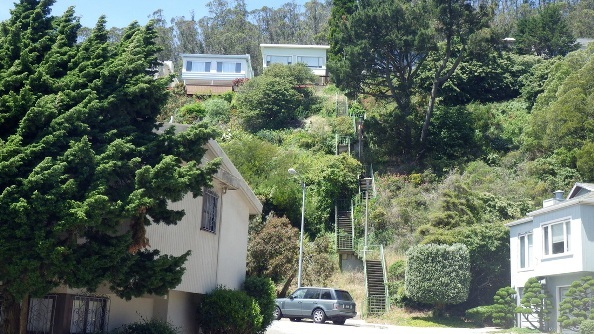 Glenhaven climbs to Christopher & Crestmont. 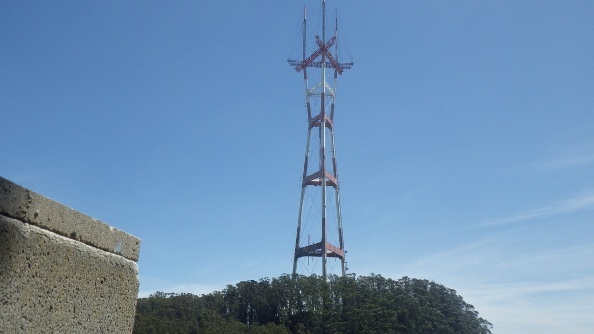 Here’s Sutro Tower viewed from Glenhaven Lane. 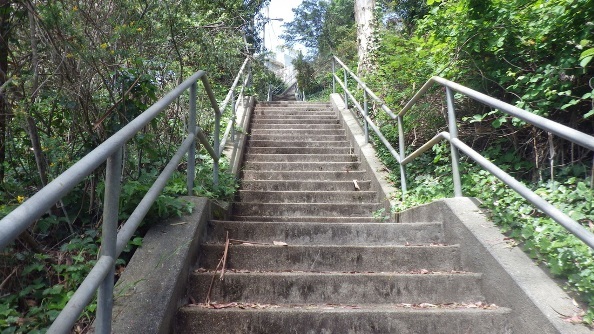 At the top of Glenhaven, I was planning to descend Blairwood Lane from its top at Crestmont. 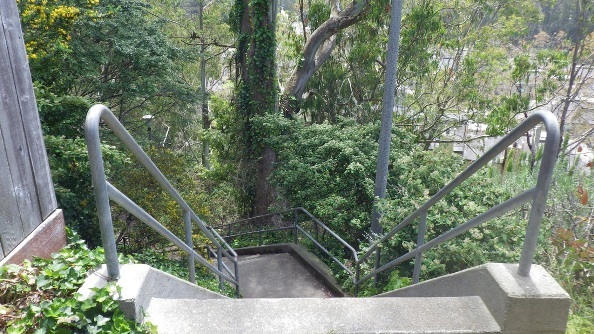 However, before reaching this, I got distracted by the rough dirt trailhead from Christopher & Crestmont and went up into Sutro Forest .